Apple on Wednesday issued iTunes 10.5.1 beta 2 to developers, adding support for iTunes Match on the Apple TV set-top box. 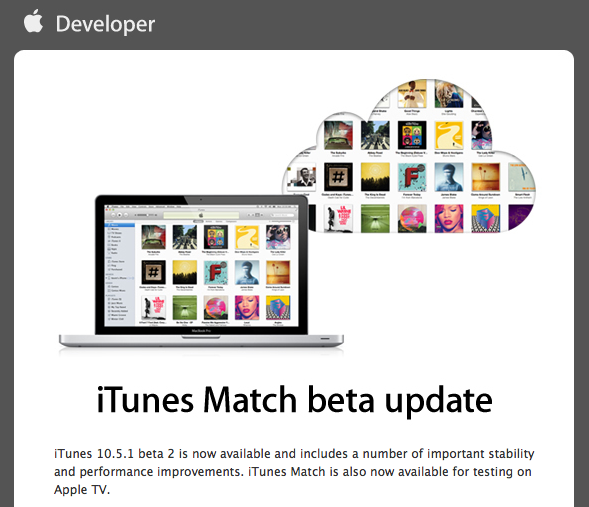 In addition to new Apple TV support for iTunes Match, iTunes 10.5.1 beta 2 includes "a number of important stability and performance improvements," according to a person familiar with the release. The Cupertino, Calif., company told developers interested in trying out iTunes Match on an Apple TV unit to first upgrade to the new beta and then turn on the service in the Music settings for the device. Apple is already a few days late in delivering iTunes Match to the public, as the company had previously said the service would launch by the end of October. People involved in the beta test had reported that the service still has a number of issues, such as stalling or incorrect matching, that needed to be resolved, but it's not yet clear whether those issues have been addressed in the most recent iTunes beta. Apple seeded iTunes 10.5.1 beta 1 to developers in October shortly after releasing iTunes 10.5 to the public. When it's released to the public, iTunes Match will cost $24.99 per year and support music libraries as large as 25,000 songs. The service will scan iTunes collections to find songs that match up with those on offer on the iTunes Music Store, making them available via iCloud. Apple also issued an iOS 5.0.1 beta on Wednesday, with fixes meant to address a battery life issue on iOS 5 devices. But, some developers report experiencing issues with installing and activating the update. According to the company, the update will arrive in "a few weeks."